“We thoroughly enjoyed working with Anita. She gave us encouragement and confidence from the outset, especially with her ideas for involving the children at every stage of development. 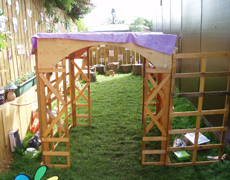 With her guidance we were able to transform an unused corner into a truly magical experience for all”, Susan Smith, Early Years Unit, Darras Hall First School. The Early Years Unit has two separate classes of approximately 30 each attending in the morning and afternoon. They are based in a mobile classroom within the grounds of the First School and share part of the playground with them. They have a small, recently turfed area at the end of their classroom which is bordered on 3 sides, by the unit and 2 fences. 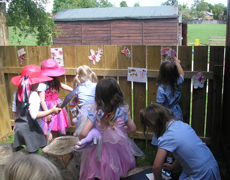 The teachers at the unit decided they wanted to create a fairy garden for the children and, with support, decided that the children should be the ones deciding what should go in it, and how it should be used. The idea was introduced by a letter from the fairies and over the following half term both classes of children created a magical space borne entirely from their imagination and creativity, complete with rules for how to behave while they were in there. 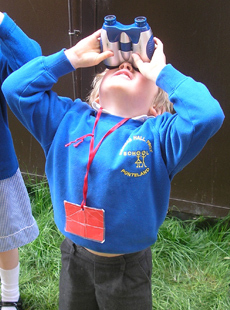 Boys and girls were equally engaged, some surprisingly so, and many children brought parents and siblings into the garden to show them around. The project supported all areas of the teachers’ planned curriculum and linked very well to the children’s activities inside the classroom. The teachers loved the way the children took the project on and commented that they had ownership of the space and felt engaged, valued and important. The project only used existing and donated resources and materials. Support was provided in a number of ways – ideas and advice at a planning meeting, on-going support, review and evaluation session at the end of the project.